Well it is Monday……and no baby yet! I was not called by the hospital to come in at all during the weekend, and I’m not sure if I will get called today. If I don’t get called by 1pm, I am going to have to call my OB and try to get an appointment for tomorrow to do my weekly BP, Protein test, and baby HR measured. Actually it isn’t ‘try to get’ it will be ‘I am coming in tomorrow’. My OB put the induction date for the 9th, and I think he actually thought they would call me by now. My thinking is that he was not on-call this weekend, and the hospital seems to have been busy….or they are just ignoring faxes again. Don’t remember if I mentioned by file issue..but they said they didn’t get my file until week 39, despite the fact that I saw the receptionist fax my stuff over during week 32…my OB had to take my file himself to the hospital and then magically tada, I got a phone call. So….clearly I don’t trust the hospital admin and I’m probably going to have to get the OB to make things happen as I do not want to go beyond Friday (42 weeks is when things get a bit dicey). So this weekend was a bust since I stayed at home for most of it because I was waiting for a stupid phone call. P ended up being able to go to the Robotics tournament during which his grade 7/8 team won two of the top awards, potentially sending them to Toronto in January for Provincials (depends if the school/parents approve). I did go grocery shopping. We put up the Christmas lights yesterday. Because we re-did the front entrance and the patio set is inside for the winter, I decided we needed some sort of Christmas decoration in the front. I picked up a Snoopy inflatable at the Canadian Tire. 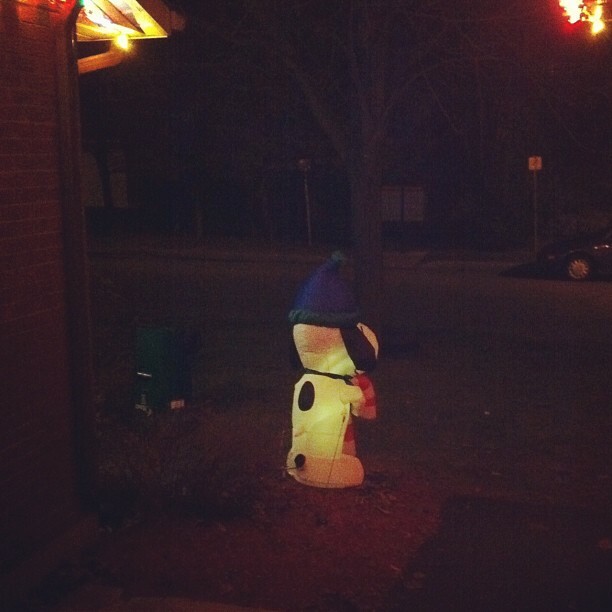 However, once putting him up, we realized that he seemed a bit lonely. I’m going to have to pick up another decoration sometime soon to allow Snoopy to have a friend. Notice the lack of snow. What the hell weather-gods? I dislike the cold very much, but I enjoy snow (except while having to drive in a snow storm). I also don’t like green Christmases. It makes me a little sad inside 🙁 Toronto almost always has a 50/50 chance of a green Christmas, but Ottawa?? Come on now! Last year we didn’t have too much snow either, but at least we had some! This Thursday’s forecast is a balmy 9 degrees and raining……wtf?